Lead an Active, Pain-Free Life! Spray Formula - Allows direct application to the affected area. Pain and inflammation reduction - Cold sensation to reduce pain and inflammation. Acceleration of healing - Hot sensation to accelerate healing. 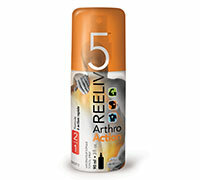 2 in 1 Fast Acting formula - anti-pain, anti-inflammatory, this formula allows immediate fast acting relief. (Adults and children 2 years of age and older): Shake well before use. Apply on affected area up to 3 to 4 times daily. Massage into skin. Medicinal Ingredients: Camphor (d-Camphor) 3%, Eucalyptus essential oil (Eucalyptus globulus - leaf) 1%, Clove essential oil 0.1%, Methyl salicylate (Methyl 2-hydroxybenzoate, methyl salicylate, Butula Lentatwig bark) 12%, Methhol (I-Menthol) 1.5%.